← May 2013 Ahi Rule May! June 2013 Ahi Bite Continues Into June! The blue marlin bite continues to be spotty at best as we headed into June. The ahi bite on the other hand is one of the best in years! The majority of our full day trips landed multiple quality fish! Josh fished a 3/4 day and we lucked out early by finding a big porpoise school all by ourselves. Our first pass yielded a triple strike and we managed 2 of them right away! We continues to work the pile and caught several more trolling. As the troll bite slowed we went to live bait and hooked a few more! 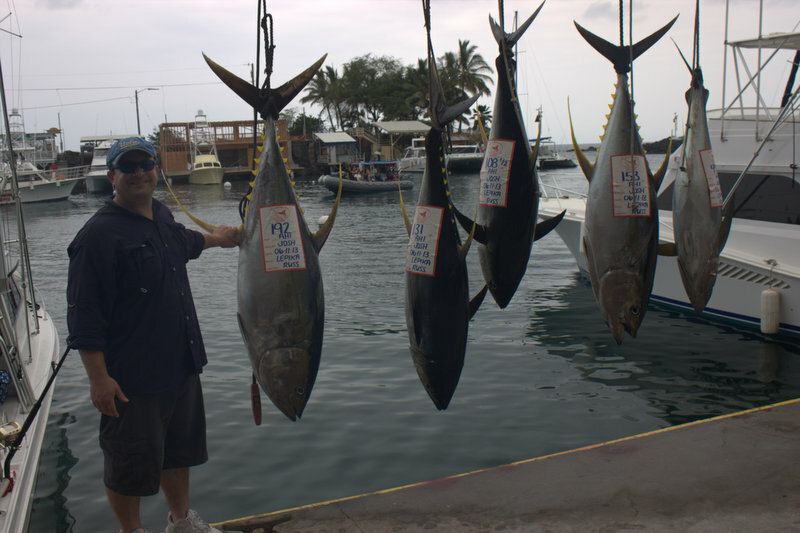 His biggest ahi that day went 192lbs! The rest were all well over 100lbs! A good friend of mine from Waimea brought along his father inlaw for a full day on the Lepika. 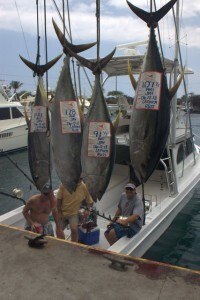 We would end the day with 4 ahi from 91lbs-144lbs! The bite was definitely on during this week! 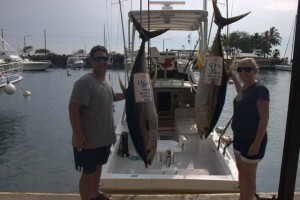 Stacey and Mike also fished with me for the first time here in Kona. They really wanted to get into fish so they booked two back to back full days with me! On the first day, we were again lucky enough to find the right porpoise school! On day one we landed with 3 ahi from 88lbs-120lbs! On day 2, we knew where the fish were and headed back to the same area. 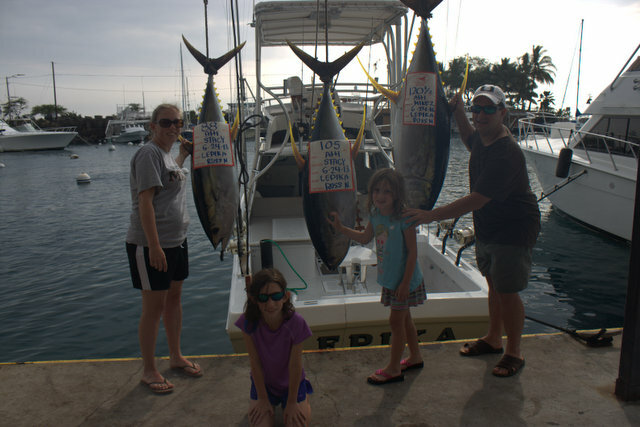 Again, we found a good pile of porpoise holding fish and quickly managed another 2 ahi from 97lbs-116lbs!